Madagascar has been experiencing a large outbreak of plague affecting major cities and other non-endemic areas since August 2017. Between one August and 19 October 2017, a total of 1297 cases (suspected, probable and confirmed) including 102 deaths (case fatality rate 7.9 percent) have been reported. Of these, 846 cases (65.2 percent) were clinically classified as pneumonic plague, 270 (20.8 percent) were bubonic plague, one case was the septicaemic plague, and 180 cases were unspecified (further classification of cases are in process). Of the 846 cases of pulmonary plague, 91 (10.8 percent) have been confirmed and 407 (48.1 percent) were probable. Between one Aug and 15 Oct 2017, a total of 793 specimens were analysed by the Institut Pasteur de Madagascar (IPM). Of these, 126 (15.9 percent) have been confirmed either by polymerase chain reaction (PCR) or bacteriological culture, 242 (30.5 percent) were probable after testing positive on rapid diagnostic tests (RDT) and 425 (53.6 percent) remain suspected (additional laboratory results are in process). Eleven strains of Yersinia pestis have been isolated and were sensitive to antimicrobials recommended by the National Program for the Control of Plague. Overall, 33 out of 114 (30 percent) districts in 14 of 22 (63.6 percent) regions in the country have been affected by pulmonary plague. 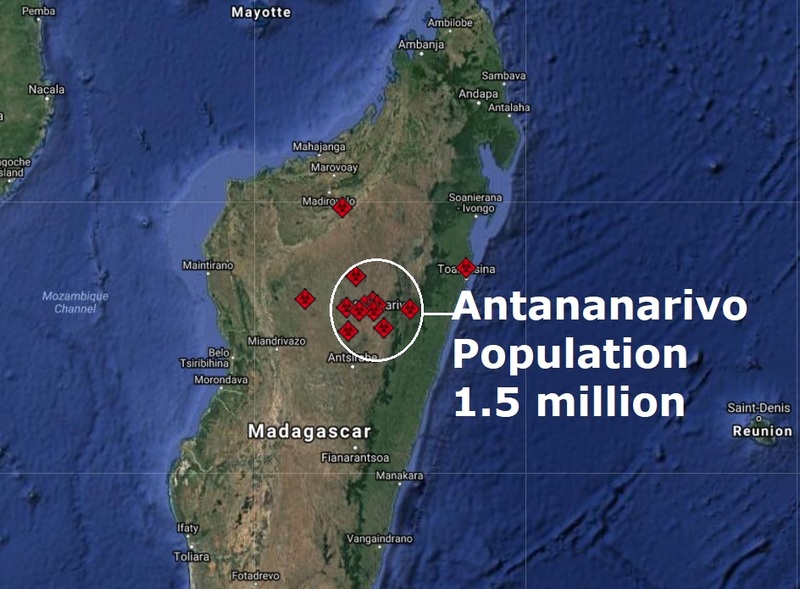 The district of Antananarivo Renivohitra has reported the largest number of pulmonary plague cases, accounting for 63.6 percent of all the cases. On 19 October 2017, 1621 out of 2 470 (65.6 percent) contacts were followed up and provided with prophylactic antimicrobials. A total of 372 contacts completed the 7-day follow up without developing symptoms. Plague is endemic on the Plateaux of Madagascar, including Ankazobe District where the current outbreak originated. There is a seasonal upsurge, predominantly of the bubonic form, which occurs every year, usually between September and April. The plague season began earlier this year  and the current outbreak is predominantly pneumonic and is affecting non-endemic areas including major urban centres such as Antananarivo (the capital city) and Toamasina (the port city). As this is a rapidly changing situation, the reported number of cases and deaths, contacts being monitored and the laboratory results are subject to change due to enhanced surveillance, contact tracing activities, ongoing laboratory investigations, reclassification, and case, contact and laboratory data consolidation.